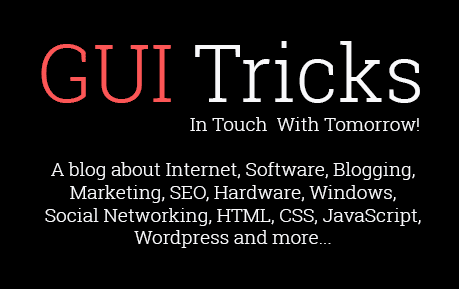 How To Create My Own Google Chrome Theme | GUI Tricks - In Touch With Tomorrow! How To Create My Own Google Chrome Theme - GUI Tricks - In Touch With Tomorrow! One of the most used Browser in the World is Google Chrome. As of January 2015, StatCounter estimated that Google Chrome has a 51% worldwide usage share of web browsers, indicating that it is the most widely used web browser in the world. People choose Google Chrome for their computers as a default browser because of it's fully trusted features that are free from any malware and spam. It's also a most safer browser due to it's best security and privacy extensions. If you're a Chrome user and want to find it's best extension then you can visit this article of Best Privacy & Security Extensions For Chrome. So, this today's article covers a simple way to create your own Google Chrome theme. I know, you have tired and bored from simple official theme of Chrome and hopefully you want some change in the style of it. Many and in different style of already created themes are available on Chrome Web Store. You can easily get and install in your Chrome. But, if you want to create your own theme that exactly according to your wish then it's not a difficult task now. You can easily create and install in your browser. A simple procedure is following below. You just have to need follow the steps. First go to link, and install an extension 'My Chrome Theme' in your Chrome. It will be downloaded and installed automatically in your Chrome you'll click on 'Add To Chrome' button. When you installed, type in search chrome://apps/ and go. Here an icon of 'My Chrome Theme' will available, so click on it and open. Now click on 'Start Making Your Theme' button and it will direct you Step 1 of making your own Google chrome theme. First step is the selection of your theme background. Drag your file means Upload your image or use Webcame and choose your background image. When you selected your background, go to the second step. In second step, you can edit Toolbar Colour, Background Tab Colour and Frame Colour. So, edit both of them according to your wish. After this, continue to the third step. Here you can give a name to your theme and can also add a short description in additional description in it. Now your theme is ready you can install it in your Chrome and can also share it with your friends. If you want to remove your created theme due to the any reason then don't panic. A simple procedure is here. To remove your created theme, go to chrome://settings/ and find Appearance. In Appearance you will find Reset To Default Theme button and Click on it. That's it now you again you will get your default theme of your Google Chrome browser. Google Chrome is really a best among all. You can work on it and can have fun with it. The above procedure is simple and easy. It's basically a simple extension of chrome. If you're are a expert then you have no need to follow my above 6 steps. I shared them for beginners for their help. So, if know about anymore best extension that can help in creating Chrome theme so don't forget to share with our readers via comment below.